We begin with the breaking of the bread. It is only a single slice—an end-piece of Sunbeam white that I’m almost about to toss in the trash. But we want to see how far it will take us. To see, that is, if from this single slice we can catch a school of flounder and a cast of crabs. Today there will be no trips to the tackle shop, no purchasing of bait, no dining out or ordering in. We have gas in the boat, a few beers. We have our fishing rigs and our crab traps. We have all day. And, of course, we have Murrells Inlet. In its most basic definition, an inlet is, as environmentalist and journalist Bill McKibben puts it, “an arm stretching inland off a larger body of water.” And while that’s certainly true enough for the Grand Strand’s inlets—Little River Inlet, Murrells Inlet, Pawleys Inlet, North Inlet—which all stretch inland from the Atlantic Ocean, between Georgetown and North Myrtle Beach, the image of a stretching arm implies a kind of idleness or laziness, and a Grand Strand inlet is anything but. Our inlets, in fact, are active saltwater ecosystems where twice a day the Atlantic ebbs and flows. Inlets are nurseries for inshore and near-shore species—places where the fish chase the minnows and the blue crabs chase the shrimp, and the anglers chase everything. Murrells Inlet, like other Grand Strand inlets, is a tidal saltwater ecosystem that serves as a nursery and habitat for many sought-after species, including flounder, blue crab, shrimp, drum and trout, as well as oysters and clams. This makes a Grand Strand inlet, above all, a flounder fishery and a blue crab crabbery. Indeed, the fish’s fat, flat, ovoid shape, and the crab’s oblique outline, with its flexing pinchers, are both something of celebrated area symbols—adorning mailboxes, restaurant walls, menus, license plates, cocktail napkins, hand towels, cheese plates and other gift shop knickknacks. Are crab and flounder not some of the most delectable Eastern Seaboard eating? Is there anything richer than blue crab meat dipped in butter? Is there any fish flakier when pan-fried than a flounder? “They’re simple ingredients, but when done right, can carry a plate, or even a menu,” says Salt Water Creek Cafe head chef, Danny Healy. As much as I revere the crab and flounder dishes in our restaurants—the crab-stuffed mushrooms at Costa, the cornmeal-encrusted fried flounder at Rustic Table, the crab nachos and crab slaw at Chive Blossom, the lump meat crab cakes at Salt Water Creek Cafe—there is a rich and time-honored history of harvesting the two species yourself. One day on the cusp of flounder season (when the marsh grass is almost about to green and the sand flies are almost about to start biting), I call up my oldest pal, Captain Jolly Roger, and I tell him I’ve got a hankering to dine on a meal of fresh flounder and blue crabs that we only catch for ourselves. A simple inlet dish. An authentic harvest. The fruits thereof. The perfect combination. Creek cuisine. “You got any bread?” he asks. I do. A single slice. The tide is dead low, just beginning to come back in, and Captain Jolly tears the slice and puts it in a wire minnow trap. He tosses the trap out into the creek so that it lands with its holes facing the channel, like a football positioned by a referee on a new set of downs. Drawn to the bread, the mud minnows flop and pop into the trap, and we haul in, culling for the biggest little suckers, which we put into the livewell. As we wait for the tide to rise, we prepare our fishing gear. Our flounder rigs are fairly standard and relatively simple: seven-foot medium-action Ugly Stiks, Penn 5400 reels, 15-pound monofilament test, a three-way swivel with a one-ounce trolling sinker through one eye and 18-36-inches of 30-pound fluorocarbon leader and a #2 kahle hook through the other. The minnow gets hooked through both lips so that it doesn’t drown. When there’s enough water in the creek—we know by the sight of the water covering the oysters—we motor out to the deeper channels and troll slowly against the tide. This way, the sinker falls to the bottom, allowing the minnow to swim freely and naturally above. The rod tips twitch as the sinker gets dragged across the bottom and the oyster beds. When fishing this way, it becomes tempting to think a fish is on, to set the hook immediately. But you’ll know when it’s a flounder. The rod tips twitch more frequently, like a finger beckoning you to come hurriedly. But because a flounder takes a few bites to eat the bait, you have to be patient. Some of the old timers say it’s best, when you get a flounder strike, to wait the time it takes to smoke a cigarette before you set the hook. But this isn’t Bill Dance or Roland Martin bassmaster fishing, with the rod tip bowing right over on the first major strike. Captain Jolly would know. He’s lived here for three decades, and he also grew up fishing for flounder and crabs in Long Island before he headed off to sea as a longlining fisherman chasing tuna, swordfish, sailfish and sharks. Now, as the lifecycle of a fisherman goes, he’s back to the back creeks again, returned to the fish he first loved. We are an unlikely pair—writer and fisherman, young professor and old salt, a Southern inlander and a Long Island bayman—but our love of the inlet connects us. And when I moved here 10 years ago, as an inlet greenhorn, I appreciated the way Captain Jolly made no bones about showing me his secrets. But there the story stops. “There he is!” Captain Jolly yells, for a fish is on, a flounder by the looks of the way the rod twitches, and so we wait. Captain Jolly sets the hooks but does not horse it. He plays the fish gently and smoothly into the net as I steer the boat. It is 16 inches long, a keeper. Five flounder later, back at his dock, with our catch flip-flopping in the sink, Captain Jolly, a fine fileter of fish, sharpens his knife. I watch him put the fish on a wooden cutting board over his sink and practice his art—running the knife-blade down the spine, making smooth cuts, taking out the little bones, removing the skin, holding the filet to the light after he’s washed it. 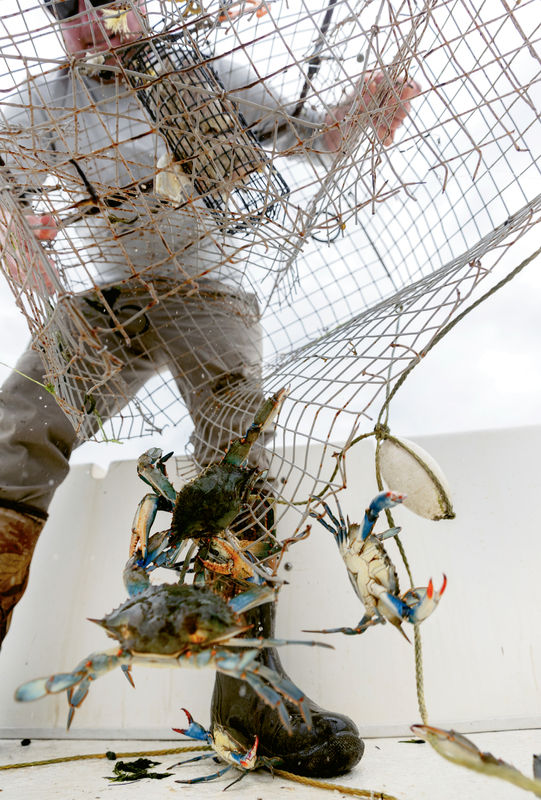 With the meat Ziplocked in the fridge and the fish guts in a bucket, we return to the dock and take a good crab trap—one with a big bait holder and rebar on the bottom, one we call a “crab motel”—and stuff it with our flounder carcasses. We throw out the trap into a hole and let it soak. We give it the time it takes to drink a six-pack—half a tide, maybe—then two more beers for good measure. When we haul in, we hear them before we see them—a watery clanging and snapping for release. But we have them—a dozen or more male blue crabs (jimmies) that we keep, two females (sooks) and one orange-sac pregnant female (sponger) that we throw back, and two stone crabs, whose biggest claws we remove before throwing them back, too. We steam the crabs on the stovetop and dump them on a picnic table papered over with last week’s Coastal Observer news. We crack back the carapaces and clean out the lungs (the wonderfully named “dead man”) and extract the lump meat. Like jewelers, we pick carefully through for tiny shards of shell. We drink beers and talk of the sea. That’s not to say it’s easy work. Heck, picking crabs is time-consuming, skilled labor. But a good crab-picking party, like an oyster roast or a shrimp boil, unites the people. Conversation flows more freely when your hands are doing something, and when everyone can agree—if you run out of things to talk about and hit an awkward silence—that this, this right here, this is damn good crab. “It sure is,” you reply, between bites. When we’ve got a bowlful of crab meat, we go inside and roll lumps of it that we top with bacon and cheese, then pack between the flounder filets. We make Jolly Roger’s Stuffed Flounder, which we pop into the oven. We wait another beer or two more. But our patience never wears thin. Indeed, our patience pays off. If you think about it, we’ve practiced what you might call old-fashioned, authentic, time-honored, traditional Murrells Inlet Sustainability. Tonight, we’re eating for dinner the fruits of our creek—crab-stuffed flounder—all for the price of a donated bread slice. All, that is, for free. These local, time-honored recipes can be made with flounder and crab meat that you catch for yourself or that you purchase in a seafood market or grocery store. As almost every Inlet chef will agree, the key is to use fresh seafood and not to overuse other ingredients. Nothing ruins a crab cake or a fried flounder filet like too much breading. A she-crab soup with too much cream is forgettable. If you pick the crabs or clean the fish yourself, also be sure to double-check for overlooked bones and shell shards. Dry rieslings, rich chardonnays, champagne and cold lagers all pair well with creek cuisine. One of the great joys of living in a moderate climate is the sheer volume of days and nights we may enjoy meals en plein air, alfresco, outside. Many of the thousands of Grand Strand eateries are designed to accommodate those looking to eat out of doors; kind of like picnicking without all the hassle. Whether creek side, oceanfront, on the Intracoastal Waterway, or even at a table on a nicely decorated tree-lined porch, enjoying breakfast, lunch or dinner in the fresh South Carolina air is a true Grand Strand treat.